I love to accept realistic challenges so when a friend proposed that we made a crown fit for a princess I could not resist. I used 22ct gold plated base and wires; 80 Swarovski Xillion fuschia and clear crystals (6mm and 4 mm) teamed with 10 rose fresh water pearls. The base is decorated with fuschia crystals and gold glass seed beads. 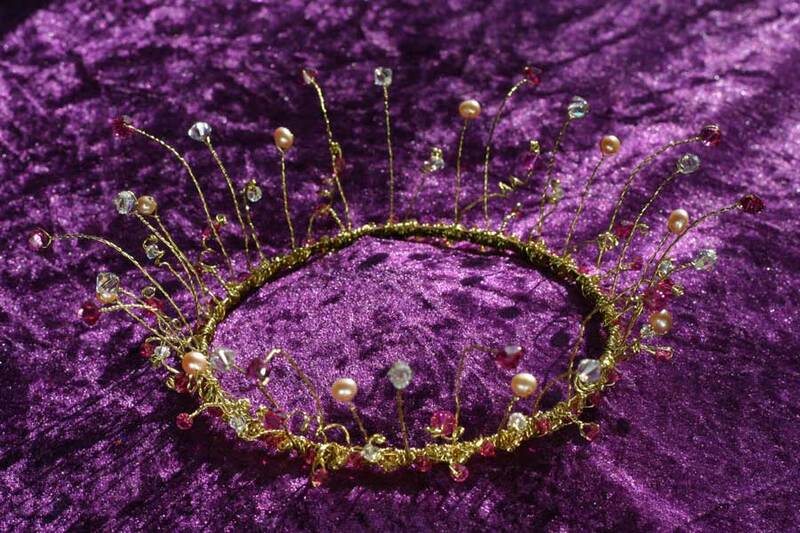 Each crystal and pearl was woven onto a gold wire, measured and attached to the crown. The project took just over 8 hours to complete. A beautiful crown fit for any princess bride. Professional pictures will be added to the website next week.